This is one of the rotating features I put up on this site from time to time. 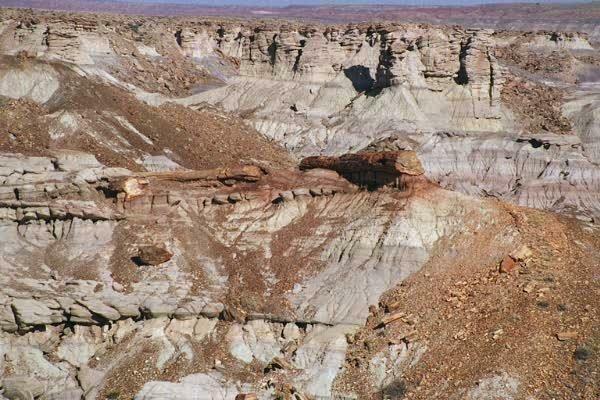 We visited the Petrified Forest over Spring Break 1998. If you decide to visit, remember, the wood is NOT COLLECTIBLE! Heavy fines apply to taking ANY wood from the Monument, and the Park Service WILL search you car! Email me for suggestions of places to collect the wood which are near the Monument. I'll start the tour at the north end of the Monument. Above is a panorama of the view from the first lookout, which overlooks most of the Painted Hills unit of the Monument. I didn't take many more pics at the north unit, since I am a rockaholic and thus could care less about pretty hills! Actually these hills are interesting since you can see the layers of red and white sediments. 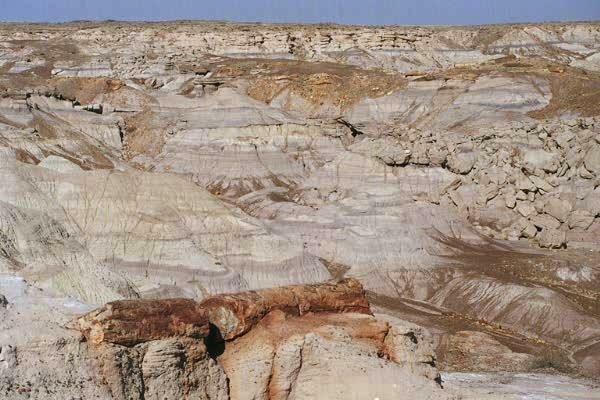 The petrified logs are almost invariably in the white sediment, which is believed to be the result of catastrophic floods caused by nearby volcanic eruptions. I've seen some pyroclastic flow and welded ash tuff deposits in the John Day formation of Oregon and these layers look very similar. So forgive me if I don't believe the flood theory - I think it was a series of pyroclastic flows and ash falls that buried the wood. 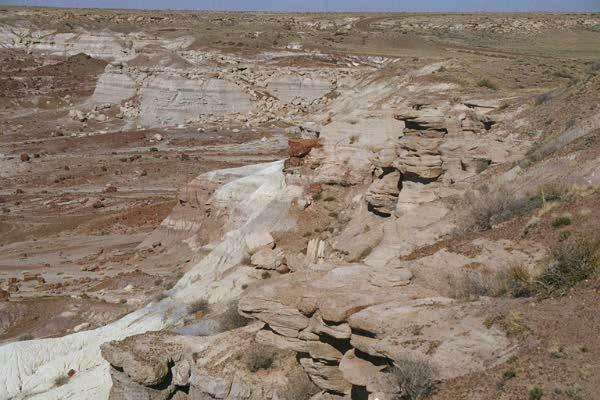 This is a good example of one of the "pedestal logs" in the Blue Forest area of the Monument, named for the greyish-blue sediment layers visible in the pic above. The logs hold the underlying sediment, which is very crumbly and easily erodible, under them, so they wind up perched on top of their own little buttes as the rest of the sediment erodes away. Pretty kewl, huh? 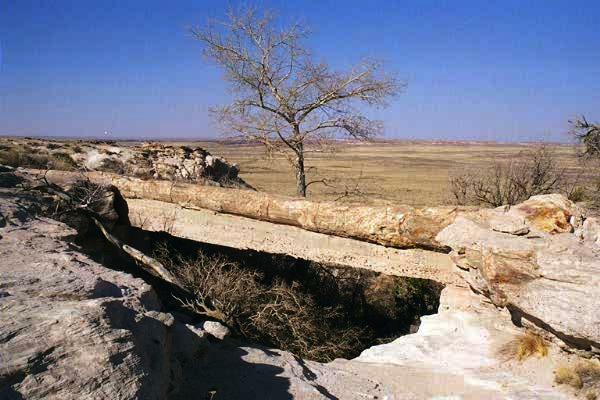 This is the famous Rainbow Bridge, a log which has been left lying across a little gully as the sediment under it eroded away. The CCC built the cement support under the log in the 1940's when the log looked like it was going to fall. If that happened today the Park Service would just let it fall. This is a panorama of the Jasper Forest, as seen from the overlook. It's hard to see the hundreds of pieces of logs littering the valley floor, which eroded out of the sides over thousands of years. These logs were the target of wood hunters even after the National Monument was established, and there is still a faint track which leads into the valley from the railroad to the north (right). This was the planned site of a mill to crush the logs into abrasives (what a waste!) which was never finished. 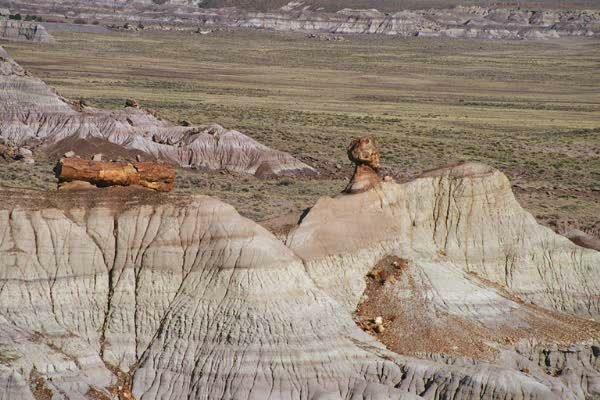 Below is a picture of a log eroding out of the formation near the top of the valley. It will eventually join its brothers down on the valley floor. 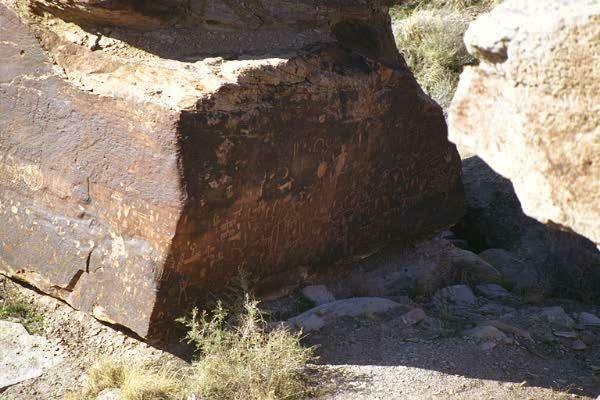 This is a shot of Newspaper Rock, which the early native people used to carve their messages on. 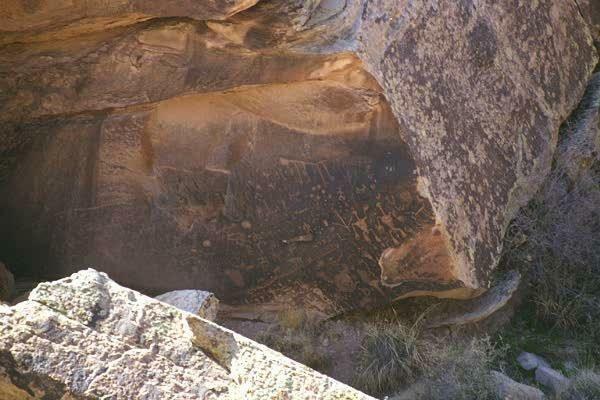 There are tens of images on this rock, among the easier ones to spot in this shot are the people near the lower right. The images continue on the face of the rock to the right. Below is another rock with many images on it. You can just make out the coyote in the shadowed face of the rock. On to Page 2 of your tour - Crystal And Rainbow Forests, & More! Yes, I want to order some Petrified Forest material!